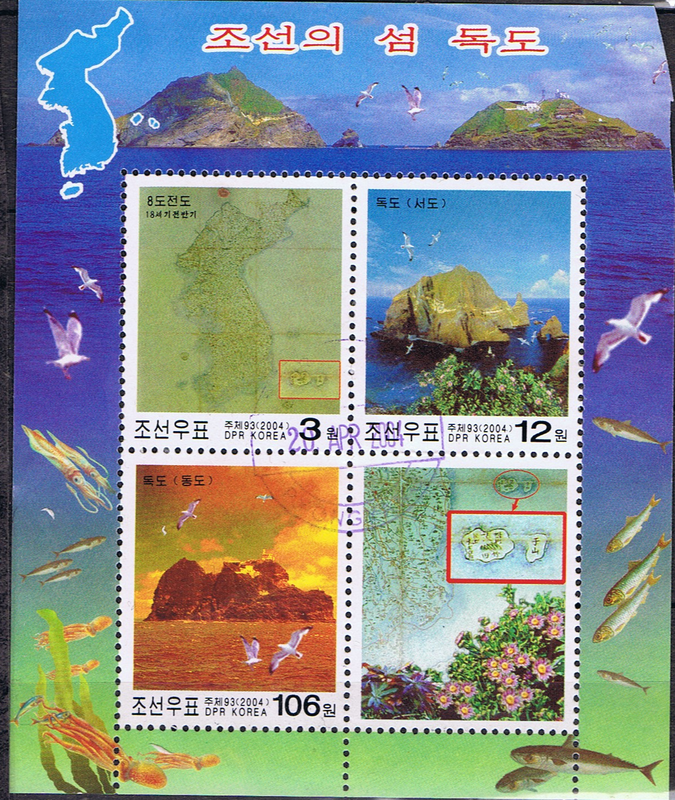 My previous blarticle on a set of North Korean stamps, raised an issue of finding genuinely used stamps from North Korea. It got me thinking that I have a ton of CTO stuff but haven't seen much that has gone through the mail. Then I came across the following sheet of 3 stamps with label. I know it passed through the mail, because it was on piece before I soaked it off. Tt is a First Day Cancel﻿ so most likely this was philatelic mail between collectors. The subject matter of the stamps are the Tok Islands. These are 2 small rocky islands and reefs located in the Sea of Japan between Honshu and the Korean peninsula. The status of these islands is under dispute with both Japan and Korea claiming sovreignity over them and the related mineral and fishing rights. The 3₩ value features a 19th century map of Korea. the 12₩ value shows the Western Island and the 106₩ value shows the Eastern Islands. The stamps were issued on April 20, 2004 and are perforated 11½.